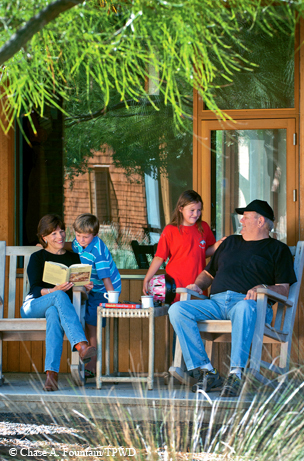 ﻿﻿﻿T﻿he transformation of an overgrazed, overhunted South Texas ranch into a haven for wildlife as well as a valuable research and education venue has earned Arthur “Buddy” and Ellen Temple the 2011 Leopold Conservation Award for Texas. ﻿Located 11 miles north of Freer in Duval County, the 11,300-acre ranch has been owned by the Temples for two decades. While the couple divide their time between the ranch and their home in Lufkin, ranch managers Robert and Jenny Sanders live full-time on the place with their 2-year-old son, Nathan. Assistant manager Kevin Anderson also stays on the ranch. The Leopold Award is conferred yearly by the Sand County Foundation (an international nonprofit organization devoted to private land conservation) and the Texas Parks and Wildlife Department as part of its Lone Star Land Steward awards program. The award is sponsored by the Lynde and Harry Bradley Fund for the Environ­ment, Silver Eagle Distributors, the Lee and Ramona Bass Foundation and Farm Credit. The Leopold Conservation Award honors the legacy of Aldo Leopold (1887–1948), considered the father of wildlife ecology. His collection of essays, A Sand County Almanac, remains one of the world’s best-selling natural history books. Leopold’s godson, Reed Cole­man, formed the Sand County Founda­tion in 1965 to protect the Leopold farm from encroaching lot development along the Wisconsin River. The Temples received a $10,000 check along with a crystal trophy at the annual Lone Star Land Steward awards banquet in Austin on May 25. They donated the money to South Texas Natives, a nonprofit group dedicated to the restoration of natural grasses in South Texas. Though they live in the tall pine country, the Temples have a long-held affinity for mesquite-studded South Texas. They’ve done a lot of hunting there over the years, and eventually leased a ranch for six years. While the ranch that caught Buddy Temple’s eye had ample water below, the initial 9,500 acres the couple bought in 1992 had definitely seen better days. Not only that, the ranch had been overhunted. Deer were only average or less, turkeys were few and far between, and quail numbers were low. That wide range of wildlife is due to the diversity and health of the habitat, as well as the water made available to wildlife via dirt tanks and small permanent wildlife water stations (fed by wells distributed across the ranch). “For the past 20 years, we have been restoring areas of unhealthy land to make it good habitat for all of these wonderful critters,” Ellen Temple says. According to ranch manager Sanders, Buddy Temple has spent a lot of time on a tractor pulling a heavy-bladed roller-chopper across the once-pristine prairie breaking up what’s called the “South Texas coating.” That chopping leaves foot-deep fractures in the soil, enabling rainfall to soak deep into the soil, where it will do the most good. When the drought breaks, Sanders says, the Temple Ranch will respond robustly. “Our goal is to get this ranch as close to its original prairie ecosystem as we can,” he says. 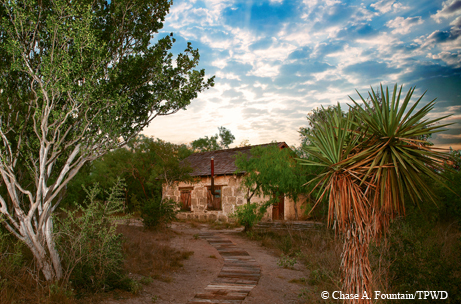 The ranch is as historically rich as it is biologically diverse. Originally known as El Rancho La Gloria, the ranch was founded by Edward Nixon Gray and his wife, Rosa Garza-Garcia Gray, in 1868. An Englishman, Gray came to Texas in 1836 at the age of 10 when his parents settled in Galveston. Six years later, the teenaged Gray joined the Republic of Texas Navy, serving on the warship Stephen F. Austin. Later he fought in the Mexican War, and during the Civil War was a captain in the Texas Home Guard. Though quick to take up arms in defense of Texas, Gray also possessed a strong entrepreneurial bent and made good money in various business ventures. Eventually, he acquired more than 40,000 acres in what is now Duval County and soon ran a flourishing sheep ranch. But deeds and surveys meant nothing to hostile Indians, who in an 1873 raid on the ranch killed one of Gray’s sons and a sheepherder. The attack occurred near an old stone house that still stands on the ranch. The Grays, who had 13 other children, went on to build a 22-room, two-story frame house on the ranch with lumber and other material hauled by wagon from the coast, brought there from New Orleans. El Rancho La Gloria and its owner continued to prosper until drought and a collapsing mohair market amid a major economic downturn in the early 1890s forced the ranch into foreclosure. Gray died in 1897. Within four years, the last 200 acres of what once had been a sprawling ranch had been sold. Fire destroyed the old house in 1936, but the various stone structures Gray built remain. Quail management: Through efforts such as brush management, prescribed fire (patch burning), targeted grazing, native plant restoration, invasive plant control, water distribution, spreader dams, strategic harvest and participation in Caesar Kleberg Wildlife Research Institute’s Quail Associates, the Temple Ranch has increased usable space and overall bird numbers and created a better distribution of quail throughout the ranch. Deer management: Increased body weights and better age structure in deer found on the ranch are attributed to the Temples’ commitment to intensive harvest management, water distribution, prescribed burning, brush management, supplemental feeding and use of level 3 managed land deer permits. Turkey management: Participation in the South Texas Rio Grande Turkey Project, riparian area protection and restoration, prescribed fire and artificial roosts are all efforts undertaken by the Temples to improve habitat, population and understanding of habitat use of turkeys in South Texas. The ranch has 21 artificial turkey roosts, which (except for three old windmills pressed into service) are made of telephone poles with fence posts attached as “limbs.” The roosts were put up after the lack of rain began killing the hackberry trees along San Diego Creek. Sanders says the big birds don’t seem to notice the difference, liking their manmade high-up hangouts just fine. 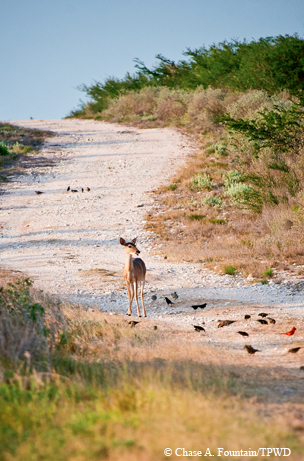 The ranch’s wildlife has benefited from the work that’s been done to the land. In addition to removing much of the overgrowth over the years, Sanders and his workers have been busy reintroducing native grasses. Broadcasting by airplane, they have spread seed for seven different grass species. Beyond improving their land, the Temples have fostered a major outreach and education effort. Buddy Temple sits on the board of the Caesar Kleberg Wildlife Research Institute and has served as its chairman for a decade. The ranch has participated in the South Texas Wintering Bird Program, Freer Independent School District field day, Buckskin Brigades, Texas A&M University–Kingsville range management classes and Wounded Warrior hunts. The Temples and the Sanderses and staff have also created native plant demonstration areas for historical preservation and education. But the Temples are as interested in the past as they are the future. Working with archaeologists, the Temples have restored some ranch structures built when the Grays first began acquiring the various tracts that would make up their ranch, and have had a historical marker placed on the ranch. They have been working with the Texas Historical Commission to get the property added to the National Register of Historical Places. If that happens, the ranch will be only the third in South Texas afforded that distinction. The ongoing drought of 2011 has had a definite impact on the ranch, but Sanders says that when it finally starts raining again, the Temple Ranch will be ready. Still, the Temples worry about the possibility of looming long-term weather changes. “Although some misinformed people deny that climate change exists and dismiss it as a ‘hoax,’ we think that it is very real,” says Ellen Temple. “When we first got the ranch, we had rainfall patterns that we, the plants and the wildlife could count on, interspersed with occasional droughts. But now drought is the norm, and we have occasional rain. The Temples aren’t going to let their concerns overshadow the honor they’ve received.